The Basset Fauve de Bretagne is one of six dogs that make up the Basset Hound family. This breed was recorded in the American Kennel Club’s Foundation Stock Service starting in February of 2015 and was assigned to the Hound Group. They measure between 12.5” to 15.5” and weigh 27-35 pounds. These small, stocky hounds were bred to be passionate hunters of hare, fox, deer, and boar. They are tenacious and stubborn, which makes them good at their job. They are also friendly, smart, happy, loving and sociable companions. As is the case with other scent hounds, they will become “deaf” to your calls when following a scent. It is important to note that a scent hound’s instinct makes training them for obedience commands challenging. That doesn’t mean it can’t be done, you just need to be realistic of your expectations. 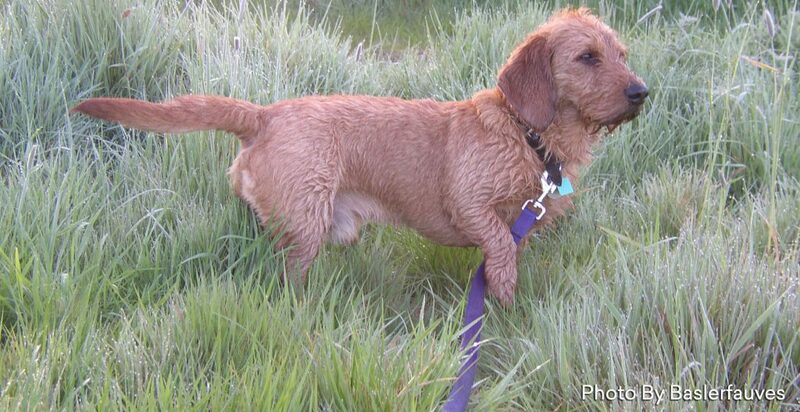 To this day, the Basset Fauve de Bretagne is used for hunting in France, where they do so either alone or in pairs. They are very agile and adapt easily to all types of terrain, no matter how difficult. 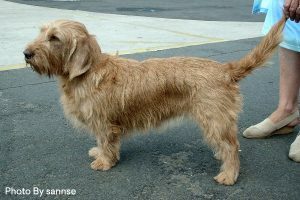 The coat of a Basset Fauve de Bretagne is rough and harsh, such as that of a terrier. It is short and curly. Their fawn color is golden wheat to red brick and can have a few black hairs on the back and ears. Their lovely temperaments, combined with the fact that they don’t require too much grooming, make them popular and versatile family dogs. You can do the grooming yourself or take them to a groomer. Their terrier-like coats need to be combed regularly but only require stripping a few times a year. This breed’s love of children and their ability to get along well with animals make them good family pets, as long as you keep in mind their need for daily supervised exercise. This exercise must take place in a safe area, as it will chase the neighborhood rabbit right into oncoming traffic. Sadly, they have a high incidence of road traffic accidents. If you plan to own one of these wonderful dogs, never forget that it may get away from you if they find a scent that attracts them. As with all dogs, training is a must. These adorable dogs are not recreational barkers, though they will not hesitate to let you know when there is a rabbit in the front yard. They will let you know repeatedly. Though they are happy to be running in your fenced-in yard, they are just as content curling up next to family members on the couch. 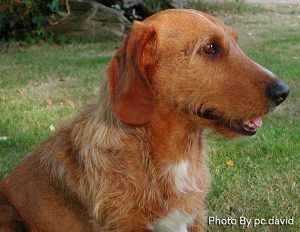 The Basset Fauve de Bretagne has a life span of approximately 12 years and is free of any known hereditary issues. The most common owner-noted health issues are reproductive, aural and ocular. Specifically, they have been reported to have otitis, corneal ulcers, and cataracts. The Basset Fauve de Bretagne Club of America, the official AKC parent Club is committed to keeping their breed healthy. They encourage owners to contact the club with details of any health problem their dog may have. If you think this might be the breed for you, contact the parent club at http://www.bassetfauvedebretagneclub.com for more information. Christina Potter has spent thirty years training dogs for print ads, websites, motion capture for video games, commercials, and TV shows–live and pre-recorded. She was the animal handler on the TV Special “2014 Hero Dog Awards”, the pilot episode of “The Good Cop,” video short “…And She Was My Eve”, feature films “Funny Games,” “As Good As Dead,” “Our Idiot Brother,” “Second Act” and “Brittany Runs a Marathon.” She has titled dogs in multiple AKC companion events. She performed trick dog demos during the 142nd Westminster Kennel Club dog show. She is the multiple award-winning author of “Diary of a Dog Star”; “Insider Training”; “Head of the Pack”; “Pepe Learns to Run Again”; and children’s book series “Hudson and Rodney Go to…”. She co-authored “Animal Stars.” She is a weekly columnist for the Three Dog Bakery company, as well as a monthly columnist for Woof. She has written many articles for national and international publications. Christina, a member of the Dog Writers Association of America, is a federally-certified court interpreter who holds a BS in Business, a Master’s in Public Administration and a Master’s Degree in Canine Psychology. She and her husband live in N.J. with their dogs: Chester, Pepe, and Rodney. Show Me The Love! Did You See That?